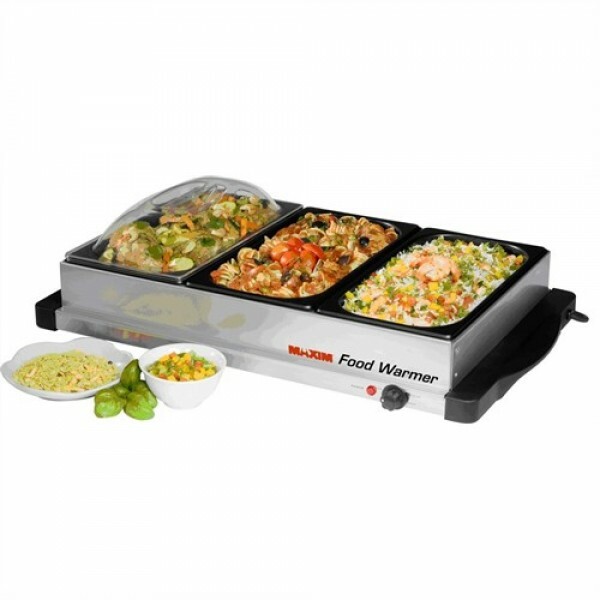 Keep your food warm at parties or functions with the Maxim Stainless Steel Buffeet Food Warmer. The 3 tray food warmer features a capacity of 2L per tray, excellent for serving a large quantity of your favourite meals or party foods to your family or your guests. Suitable for BBQ's, parties, functions or conventions. 3 Non-Stick Stainless steel trays with 2 litre capacity each. 300 Watts heat range 60 degrees C to 80 degrees C With 3 heat setting. Thermostatic control on highest heat setting. Quality stainless steel, polycarb lids, cool touch handles and slotted lids for easy handle storage. Heat plate can be used for dinner plates or even casserole dishes. Dimensions: L 62 x W 36 x H 11 cm.